To enhance the heat efficiency of stenter or drying machine, the most effective way is to reduce the moisture content, the lower the better, of the fabric before entering into the drying oven. Fabric can be mainly divided into two categories of hydrophilic and hydrophobic. The way to remove the moisture content inside is different according to fabric nature. Generally speaking, hydrophilic fabric like cotton uses squeeze method to remove the moisture content, whereas hydrophobic fabric like filament adopts vacuum (negative pressure) suction method. The efficient concept is showed as the chart below, where the 50/50 composition point is the efficiency demarcation. Adopt negative pressure auto detecting and controlling system to ensure the stability of air flow volume and consistency of fabric moisture absorption. Air-water separation design can automatically eliminate water and pollution to avoid downtime maintenance and remain air flow volume consistency. Applicable for the equipment of stenter, water suction machine, etc. and suitable for the fabrics of non-woven, woven, knitting, and so on. 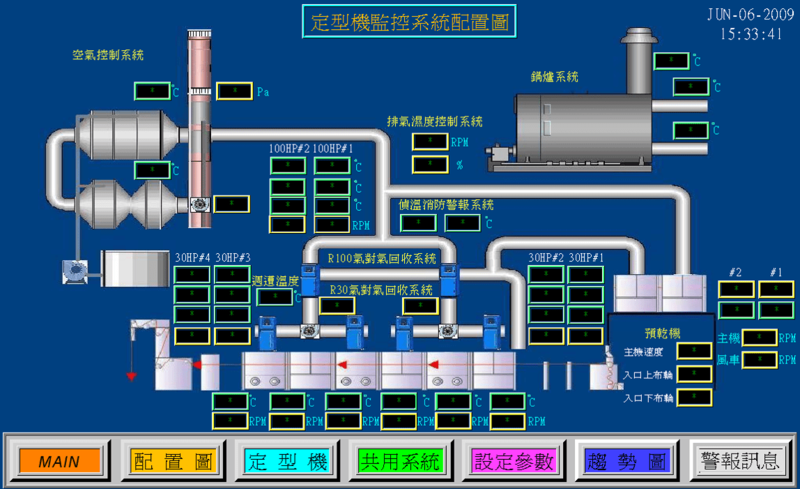 Adopt PLC for auto calculation programming and 7” color HMI auto control system. With recording function which can simultaneously record the operating conditions of vacuum slot system, to improve the efficiency of thermal energy and reduce the energy consumption required from unit fabric. One-to-one or many-to-one record system which can be used to collect records to the same host system. 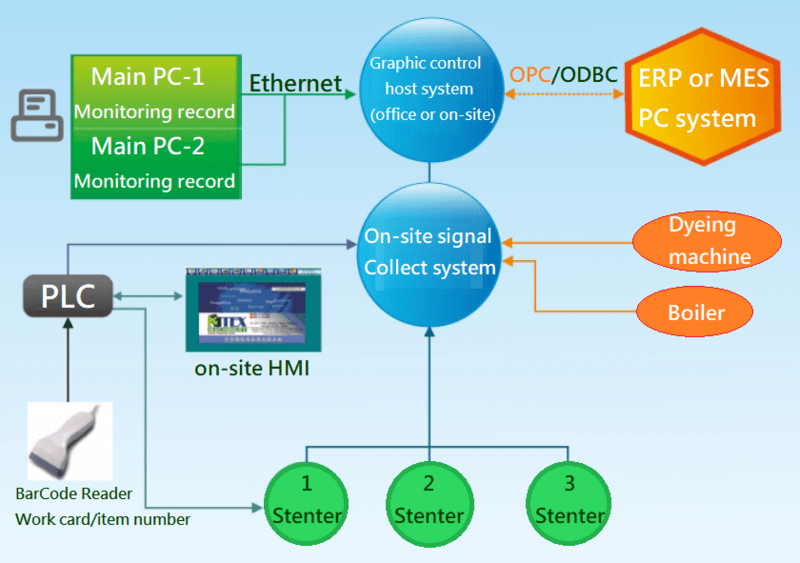 The host system information is opened by the Ethernet to the remote supervisor computer to monitor the operation status of the plant. 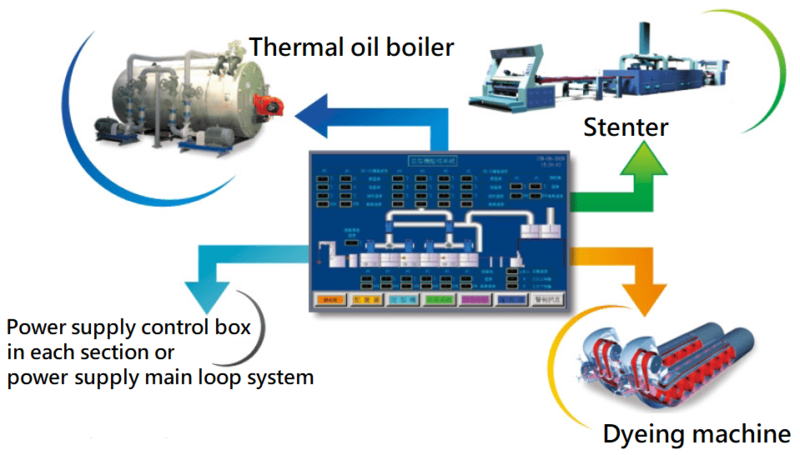 Recording points can include integrated record management of stenter operating conditions, boiler energy supply unit, power management, and thermal energy recovery system. At the same time, the integrated analysis record curve is used as the basis for timely adjustment or maintenance of the overall energy management system. Use the office host system (requires Windows XP-P OS), or add a collection host on site. Through ODBC or OPC links, records can be integrated into ERP or MES systems to manage on-site production information (optional). Use work card or item number to manage the positioning, so that the product can be searched and integrated in that production conditions of the process. Use OPC, ODBC and MES or ERP PC database to exchange relevant information. Offsite backup to avoid the risk of data loss. Combination of production cost analysis and management, which is conducive to process energy conservation improvement (energy management system). Record management to save production cost and facilitate abnormal diagnosis management. Standard graphics control software and program set; the signal collection box adopts A/D converter and PLC as the main collection converter. The signal of the recording point is provided by the existing electronic control unit. A set of on-site collection boxes and computer systems. Planning according to actual points.